Both Stubbington and neighbouring Crofton were mentioned in the Domesday Book (the 11th century UK census) as small districts belonging to the estates of Titchfield Abbey. The earliest known cricket match to have been played in Hampshire took place on Tues 22 May 1733 in the village. It was between Married v Single. The Married team won. Details were found by Martin Wilson in the American Weekly Mercury, a Philadelphia newspaper dated 20 to 27 September 1733. Mr Wilson subsequently found an earlier version of the report in an English newspaper, the 18 June 1733 edition of Parker’s Penny Post. The ‘Crofton Old Church’ at Crofton is one of the oldest known inhabited sites in the area. It was mentioned in the Domesday Book and it is thought to date back to the reign of King Alfred in the 9th Century. It is believed to have caught the eye of Samuel Pepys in 1662 and was extensively renovated during the 13th Century. 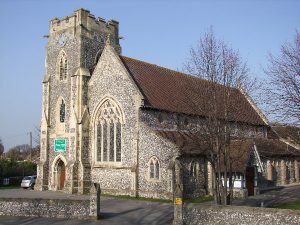 A new church (Holy Rood) was built in Stubbington which took over the function of Crofton Church in 1878. Copyright © 2019 Stubbington Churches.